And I'm so glad I did. 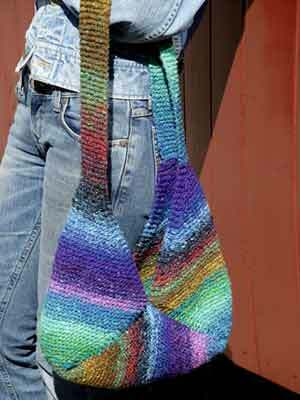 I've almost finished Cornelia Tuttle Hamilton's Lotorp Bag in the recycled sari silk. I LOVE this pattern. LOVE. Such a clever and elegant construction! After I finish this one in the recycled silk, I'm going to do one in Kureyon and one in Iro. This is a great bag project. How about in Transitions? So tomorrow, I'll knit the last 10 rows on the ribbed raglan sweater and sew it up. Maybe even wear it Tuesday. We'll see. Do you think I have to sew the ends in for it to count as a finished object?